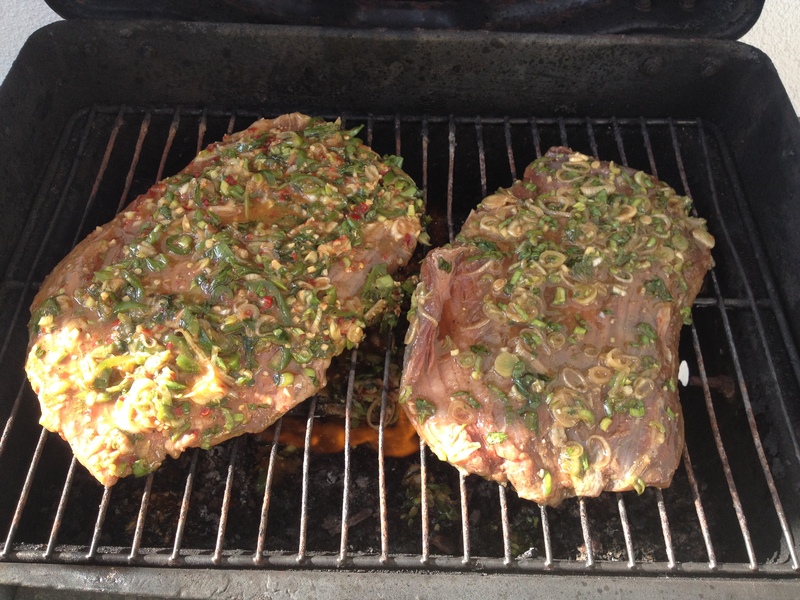 Yup, that’s two flank steaks (about 1.5 pounds a piece) — one for the adults (front) and one for the kiddos (back). You guessed it: spicy and on the sweet side, respectively. We love picking up the two-pack flank steak at Costco because we can ensure our meat is as spicy as we want it and then the kids have a great meal for at least three to four different nights during the busy work/school week. This is Asian-inspired and I do not have exact amounts because I’m a throw-it-in-and-taste-it kind of gal. But I’ll give you some starting amounts from which you can work and I’m including substitutions for items if you don’t have the exact ingredients in your pantry. Most of these are staples in my house, as I’m guessing they are for most folks with a fondness for cooking. 1. Slice the green onions, mince the garlic, chop the cilantro and set aside. 2. 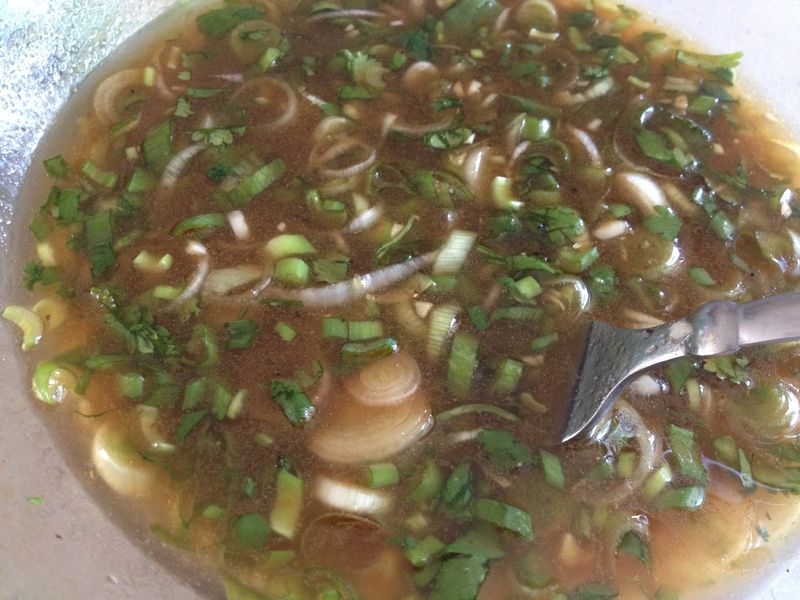 To a medium/large bowl add the oils, soy sauce, vinegar and honey and whisk vigorously. 3. Grate your fresh ginger and add to the wet ingredients. 4. Add the green onions, garlic and cilantro and mix well. 6. Pour half the mixture into a Ziplock bag and add one of the flank steaks to it, making sure to cover completely. Put in fridge for at least 4 to 6 hours, even better if left overnight. 7. 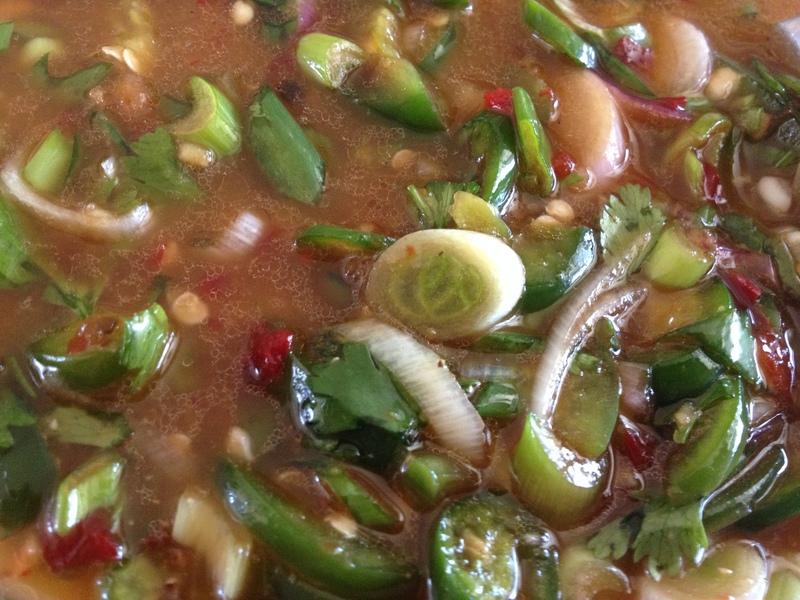 Slice the jalapenos and serranos and add to the base mixture. 8. Add the garlic chili paste and whisk vigorously. 9. 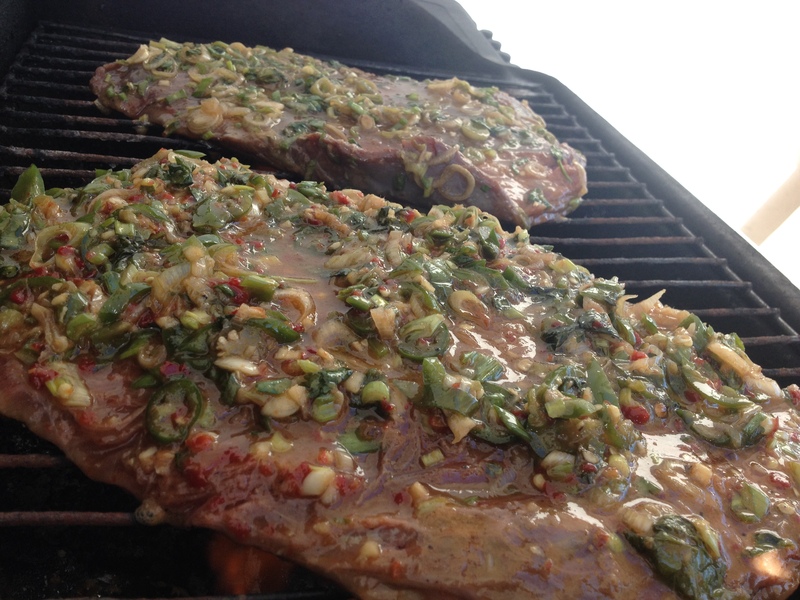 Pour the rest of the marinade into a new Ziplock bag and add the other flank steak it, covering completely. Put in fridge for at least 4 to 6 hours (overnight is better, of course). 10. Bring steaks to room temp before turning on that lovely grill outside. Grill those puppies up to medium rare, slice against the grain and enjoy! We were so hungry I forgot to take a picture of the meat after it was done cooking. Needless to say, my husband grilled it to perfection and we mowed these puppies down with our favorite coconut cilantro rice from Emeril Lagasse. Ha Ha! 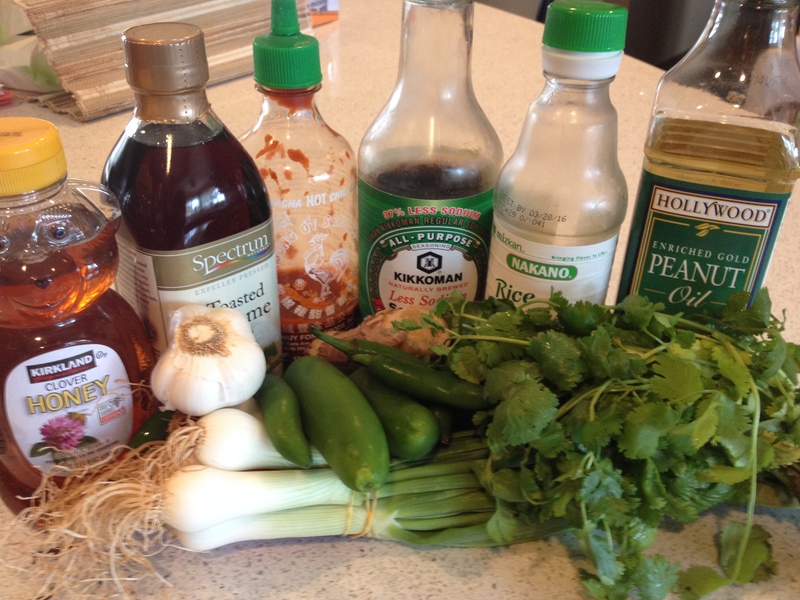 I love “cooking with abandon” — it makes it sound so much better than, “because I’m too lazy to dirty the measuring cups and spoons.” 🙂 By the way, the marinade is excellent for chicken, too. Thanks for stopping by — I appreciate the feedback!